Sarah Hendrickson flies through the air above Aplensia Olympic Park in Pyeongchang, South Korea on Monday during the women’s normall hill ski jumping competition at the 2018 Winter Olympics. PYEONGCHANG, South Korea — Sarah Hendrickson isn’t a “happy just to be here” kind if person. You can’t be and still build the kind of sports resume she has in his career ski jumping, winning a World Championship and competing in two Winter Olympics Games. 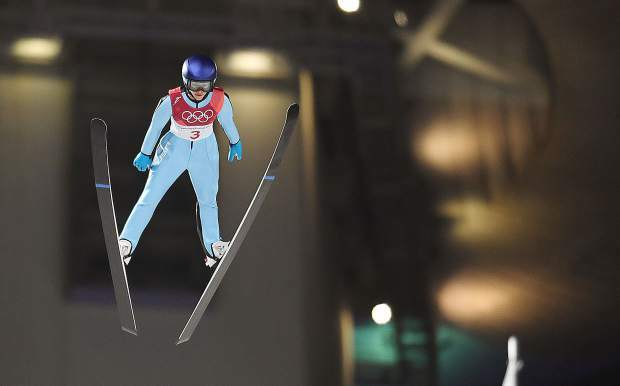 Nevertheless, she couldn’t help the emotion Monday night after landing her second jump in the 2018 Winter Olympics normal hill women’s ski jumping competition. She’s dealt with so many injuries, so much setback, she knew before she jumped she was a long shot to be competitive for a medal. Nevertheless, she didn’t have a hint of doubt about the hurdles she’d jumped to be there, about all she’d given up to live the dream one more time. Hendrickson was 19th in Monday’s event at the Alpensia Ski Jumping Center in Pyeongchang, South Korea. It was the only women’s ski jumping event at the 2018 Olympics. She had the 23rd best jump of the first round, good enough to qualify among the top 30 in the event. She then had the 21st best jump in the second round and that was enough to push her into the top 20, bettering her performance in Sochi, where she placed 21st overall. It was a “happy to be there” kind of night for all three of the U.S. women. Norway’s Maren Lundby had the best jump in each round to win the gold medal. Katharina Althaus of Germany took silver and Sara Takanashi landed the bronze, much to the delight of a large and dedicated Japanese contingent of the crowd. Hendrickson was the top American finisher. Abby Ringquist was 29th and Nita Englund, a Wisconsin native who trained in Steamboat Springs, 31st. It was the last Olympics for Ringquist, and likely for Hendrickson, as well, marking the end of an era for the U.S. women, the era of the founders who were there when it started. Ringquist, from Salt Lake City and living in Park City, Utah, has been a fixture on the World Cup as long as there’s been a World Cup and international competition, 2004. She said she hopes in her wake there will be more opportunities for women in the sport, especially at the Olympics, where women compete in just one event while men compete in three, a large hill jump, a normal hill jump and a team event. There was a time Hendrickson would have entered Monday’s competition aiming for a medal. Monday, she was happy to be able to jump pain free, not an insignificant consideration given the multitude of surgeries that robbed her of so many competitions.